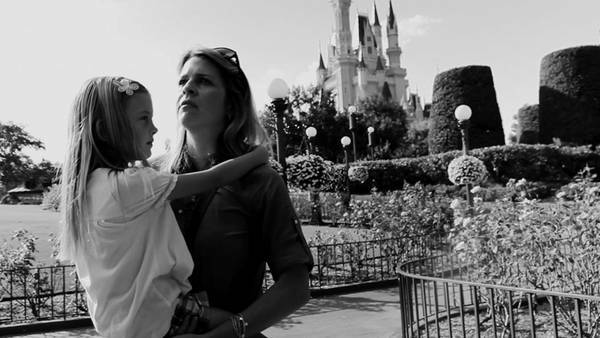 Escape from Tomorrow is the absurdist story of a father’s mental breakdown while on a trip to Walt Disney World with his family. In the opening moments of the film, our protagonist Jim White is on his last day of vacation at the Disney resort and is enjoying the morning on the balcony of the family’s hotel room. 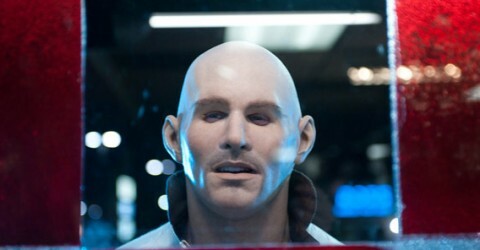 He is on the phone with his boss, whom fires him for reasons unknown. Then Jim’s son Eliot locks the door to the balcony and climbs in bed with his mom (Emily). Sleeping in the other bed is Jim’s daughter Sara. Both of the kids are around five or six years old, which adds to the stress of the situation as they go into the park. The weight of the job loss plus having to deal with the temperaments of his children lead to fights between Jim and his wife. It also doesn’t help that Jim has developed a crush on two teenage French tourists (one of which is played by Annet Mahendru of The Americans) who are also visiting the park. Throughout the film, Jim and Emily take turns taking care of Eliot and Sara individually. On it’s A Small World, Jim hallucinates Emily tells him “I hate you”. His spiral down the rabbit hole grows deeper as the film goes on, and his obsession with the teens grows. The film plays up the dark side of family vacations and how real life mars the escapism the park offers. It’s darkly humorous as the stress of Disney World takes it’s toll, and Jim discovers some of the Mouse House’s sinister secrets (i.e. the princesses are hookers who are sold to Japanese businessmen). The plot is a bit uneven and it’s perhaps too strange for casual film goers, or Disney purists, but for me it was a solid effort. The middle drags a bit, but the ending at Epcot is deliriously amazing. 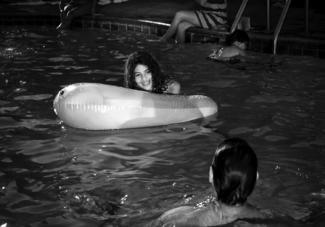 Escape from Tomorrow is the directorial debut of Randy Moore, who managed to shoot the film on handheld cameras in the park without Disney knowing. It’s been hailed the “ultimate guerrilla” film. While watching it, I kept this fact in mind because the actors playing the family do look like people you’d encounter while at the resort. The concept of making a movie discreetly in a theme park is insane; and yet they managed to pull it off! It’s hard to imagine someone making a film while on the rides at Disney without being noticed. 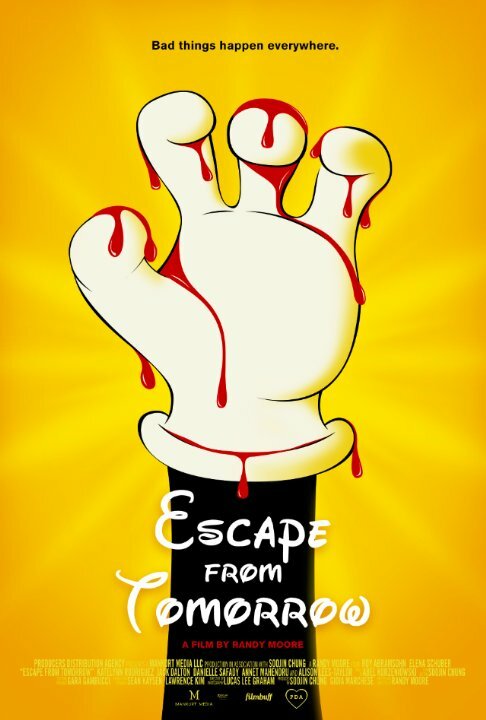 Escape from Tomorrow is the cinematic heist of the century, and they got away with it! The movie was filmed in black and white to avoid issues with lighting (it’s hard enough to film in Disney, bringing a lighting crew would have been a bit tough) helps to heighten the sense of surrealism and also adds to the ambiance and beauty of the some of the scenes, especially those on the monorail. I’ve only been to Walt Disney World twice, and both times were almost two decades ago, but the memories were fun. I went there in 1996 before my dad died on an eighth grade class trip and in 1997, a year after my dad died with my family. Both times were a very surreal experience due to it serving as bookends to a very rough chapter in my life. I loved the place and it seems Randy Moore has a scathing view of it, which is understandable. During the end, a “wicked witch” character describes how she went from Disney princess to becoming who she was. “Sadness is a part of life” she says, “no one is ever that happy. It’s unnatural”. As it turns out Moore’s parents divorced when he was a kid and his father used to take him there frequently. The two are now sadly estranged, and Jim took his own family there and all the moments came flooding back to him, which led to the inspiration of the film. 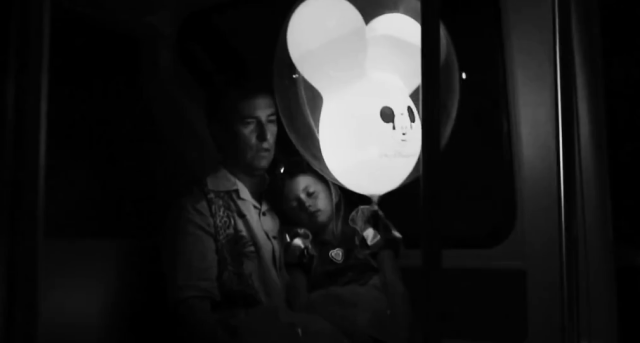 Disney has a special place in the hearts of many families, and Escape from Tomorrow touches a dark subconscious place that we can all relate to where the innocent ghosts of our childhood clash with the cynicism of adulthood. Think of it this way. Imagine American Beauty with a blacker heart directed by David Lynch and shot on location in Disneyworld.